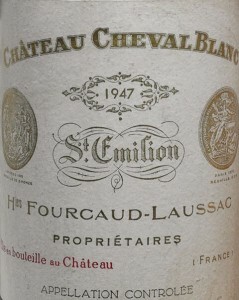 Château Cheval Blanc 1947 has an extraordinary reputation and many of the world's greatest connoisseurs have always raved about the wine and its unique qualities. Such is the demand for it that it seems likely an upcoming sale of various different vintages direct from the château, and which includes this famous year, are likely to sell for record prices despite the current economic climate. The 2008 en primeur release prices for Cheval Blanc, which is a terrific year for the Château by any standard, were recently released at one of the highest price of any first growth ($5,624 per case). But just why was this 1947 vintage so extraordinary? Pierre Lurton, who manages the estate on behalf of its owners describes it as “an accident of nature”. “There is a lot of volatile acidity which enhances the aromas, with some residual sugar which gives a lot of sweetness and fatness. The wine is alcoholic for its time, 13.5%-14%.” Indeed, it was very rare to make a wine of more than 13% and more often 12.5% or even 11.5% were quite common. Some have cited difficult wine-making conditions (temperature controlled fermentation vats did not exist at the time) but the problems which had already been encountered in respect of the 1945 vintage in which the wine was fermented in wooden vats, were therefore less acute in 1948 when the wine was made. Not least because they had learnt the lessons of the vintage 2 years earlier. 1947 was a very hot year by any standards and this would have concentrated the sugars, the wine would have been low in acidity and it would have had very ripe tannins. The heat would undoubtedly have given problems with the health of the grapes at harvest, there may have been complications because of rot in the vineyard and this might also have contributed to the kind of microbial contamination which gave rise to the VA (volatile acidity), although these bacteria can be anywhere and appear at any stage of winemaking. According to Tastet & Lawton, a firm of courtiers in Bordeaux who have maintained records on vintages for many decades (if not centuries), the sequence for that year in terms of ripening in Bordeaux demonstrate the precocity in 1947, compared to 2003 (in brackets): first push of the vine 1 April (20 March), peak flower 30 May (30 May), first change of colour (véraison) 18 July (11 July), Harvests started: 15 September ( 2 September) and general harvests around 19 September (11 September). This might possibly suggest that the harvest for that year were slightly delayed (for whatever reason) which would have further contributed to the maturation and character of the wine. Since this was one of the first harvests after the Second World War, it seems likely that there may have been some disorganisation in the vineyards at this time. Undoubtedly coping with the high levels of volatile acidity would have been a problem in 1948. Today, there are a variety of means to keep it in check or remove it, although using reverse osmosis to do this is prohibited in Bordeaux. The bacteria which causes it have the need for sugars (which is why in hot years wine is more at risk because there will be more sugar in the wine) and air (oxygen), both elements which would not have been well controlled during this period. Without temperature control, as the wine's temperature increased, it might have killed off the yeasts needed to turn the sugar to alcohol and one was then left with the wrong bacteria which could augment the VA. As a matter of small interest, in the US one is not allowed to import a wine with a VA level which is in excess of 1.2g/litre. Cheval Blanc has a very high proportion of Cabernet Franc in the blend. The qualities of good Cabernet Franc contribute in making a wine with great structure, freshness and finesse. Lurton thought the blend would have been around 60% Cabernet Franc and 40% Merlot for the 1947. What kind of life does it have in the future, is a good question? Lurton is certain: “It's still a teenager – perhaps another 40-50 years." However, some have suggested, that it may be a little tired although the magnums being offered should guarantee some extended lease of life. In July 2000 our FWAI50 stood at 153.06, today it is at around 183. Based on this alone one might expect a value of some 20% more than was realised in July 2007, e.g. $14,500 per 75cl equivalent, but this is already way above Sotheby's high estimates. They have estimated a rare three vintage vertical including 1947 (and 1948 and 1949) at $12,000 for all three bottles. However, this doesn't take into account the wines' provenance, which is surely unique, and would give values much, much higher. On the other hand, looking at Cheval Blanc alone, its index in July 2007 was 186.05 and in April 2008, 143.40, (note however, that this doesn't include the vintage in question but is based on the FWAI50 selection). This might suggest a value closer to $9,000 discounting provenance and is more in line with the estimates provided by Sotheby's. The Indices for Cheval Blanc peaked in the last quarters of 2007 and 2008, which may also reflect the presence of particular buyers in the market at those times. Will they return for this special offer? A snapshot of the top selling cases of the 1947 at auction Note 1from a total of 61 auction records between 2003 and 2009 show Sotheby's in London hold the record for the highest price of a case (see below). Whilst Acker Merrall & Condit (US auctioneers) sold one bottle last year for a record $20,000 for one magnum. Do formats make a difference? Based on auction results alone one must accept that different formats are not always sold at the same time. However, if one were to hypothesise about the likely values certainly auction data tends to bear this out. Half bottles, for example, never a good way to store old Bordeaux, have never even made it over the $800 per bottle value which might equate to $1,600 for 75cl. Magnums, the best, have provided consistently high values. 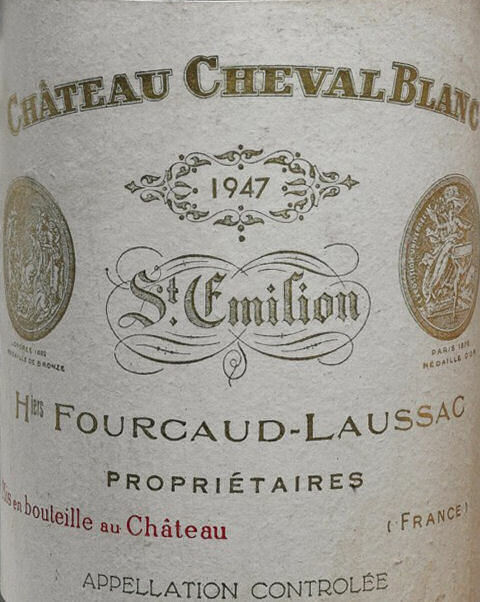 Although a magnum of Cheval Blanc 1947 was sold at Sotheby's in 2008 for a mere $5,750 Note 2Sotheby's Finest and Rarest Wines, Featuring Treasures from the Cellars of Pichon Longueville Comtesse de Lalande, 12th November, 2008. Sale no.L08611.